The National Institute for Health and Care Excellence (NICE) issued its first guideline on menopause last week. The guideline contains recommendations for doctors, nurses and hospital specialists working within the NHS on how to diagnose and manage the often debilitating symptoms that many women suffer during the menopause. The main thrust of the guideline, which was two and a half years in development, is that the benefits of HRT far outweigh the risks; HRT is a safe and effective treatment for menopausal symptoms and should be offered to women experiencing hot flushes, night sweats and low mood. The developers of the guideline hope that it will stop women suffering in silence and ensure they get the treatment they need to help their often debilitating symptoms. They are concerned that many women have missed out on the advantages of HRT either because they believed it was riskier than it really is or their GP never offered them the choice to begin with. For more than a decade GPs have been unwilling to prescribe HRT because of the cancer risks that were exposed in the results of the Women’s Health Initiative (WHI) study. This study was abruptly halted in 2002 because researchers became alarmed at the increase in cases of breast cancer, heart attacks, strokes and blood clots after an average of 5 years of use. A year later, in 2003 the Million Women Study conducted in the UK showed higher chances of breast and uterine cancer in women on long-term HRT. After these two major scares, doctors around the world stopped prescribing HRT. Following that there was a dramatic reduction in the number of cases of breast cancer diagnosed in the USA, so make of that what you will. What I find most interesting about the WHI study is the type of HRT that was prescribed. The women not receiving placebo were given a daily dose of Prempro (a combination of oestrogen and progestin – 0.625mg Premarin + 2.5mg Provera). Those who’d had a hysterectomy and not randomly assigned the placebo were given 0.625mg Premarin (oestrogen only) daily. 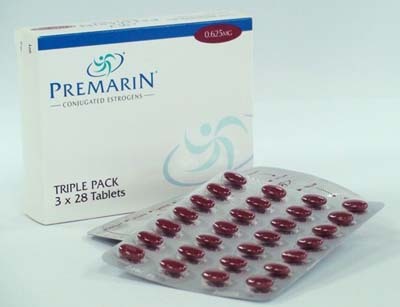 Premarin and Prempro were chosen because they were the most commonly prescribed forms of HRT. They still are. The Premarin family of drugs contains estrogenic compounds that are made from the urine of pregnant mares. That’s where the name is derived from: PREgnant MAres’ urINe = Premarin. Any HRT with ‘Prem’ in the brand name (Prempak-C, Prempro, Premique) is likely to contain conjugated equine (o)estrogen (CEE) and is a synthetic form of HRT. The problem is that CEEs are not metabolised well by the human body often resulting in serious side-effects. There is also the issue of animal cruelty when it comes to the treatment of the pregnant mares. This type of synthetic HRT has been implicated in thousands of cancer cases and is known to increase the risk of stroke, breast cancer and thrombosis. A study has also found that HRT preparations which contain progestogens, synthetic progesterone, (found in Prempak-C and Prempro for example) are more likely to cause breast cancer when combined with oestrogen than natural progesterone. Unfortunately, when the results of the WHI study were publicised, no distinction was made between synthetic conjugated horse oestrogens like Premarin and bioidentical oestrogen and progesterone and so all HRT got a bad rap and many women missed out on treatment that could have improved their quality of life immensely. Before I go any further, let me be clear that I am not completely against the prescribing of HRT. I am one of those unfortunate women who experienced severe perimenopausal symptoms and taking bioidentical HRT restored my health, my sanity and my relationship for a while. But I have also experienced the side-effects of Prempak-C and read a lot of research about the cancer risks associated with conjugated equine oestrogens, which is why I wish more doctors were familiar with the kind of bioidentical HRT that is available on the NHS. I was really hoping that the NICE menopause guidelines were going to clear up the confusion that many doctors have when it comes to prescribing HRT. With so many different products to choose from, NICE has done nothing to make the ordinary GPs job any easier. the belief that it is the most convenient way to take HRT (a daily pill with the oestrogen and progestogen packaged together) and menopausal women can’t be trusted to take different forms of hormone therapy at the right time because their brains are too addled by hormone deficiencies. When patients ask for bioidentical HRT, which is available on the NHS in the form of oestrogen patches (Evorel) or gel (EstroGel) and Utrogestan progesterone capsules or Cyclogest progesterone pessaries, they are usually told bioidentical HRT is unsafe and cannot be prescribed. In some cases the doctor has never heard of bioidentical HRT. The NICE guidelines mention compounded bioidentical hormones, which is the type of HRT that can only be prescribed by a private doctor, is unregulated and untested and has to be made up by a compounding pharmacy. But it does not mention bioidentical hormones that are made from plant sources and synthesised in a laboratory by smaller pharmaceutical companies, have been tested for safety, are likely to have fewer side effects, and are available on the NHS. GPs need to be told that these forms of HRT, which usually come in the form of patches, gels, and pessaries, are actually bioidentical. All This in just 10 Minutes? Another limitation with the guideline is the issue of time. How any GP is going to be able to diagnose menopause, dispense all the information and advice contained in the guideline, and prescribe the appropriate treatment in 10 minutes is beyond me. It is not humanly possible. The information that needs to be imparted would take at least half an hour, and that’s before the patient has said a word. If you are going to speak to your GP about your menopause symptoms my advice would be to book a double appointment. I was heartened to read one of the recommendations of the guideline which addressed the need to improve knowledge about the long-term benefits and risks of HRT among healthcare professionals. Just last week, a Write Health reader wrote to tell me that her GP had prescribed oestrogen only to treat her menopause symptoms. This woman still has her uterus and taking oestrogen only is probably the quickest and most efficient way to develop endometrial cancer. My own GP, who I trust and respect, believed that HRT was only prescribed for women who are postmenopausal, not for those who may be experiencing up to 15 years of perimenopausal symptoms. 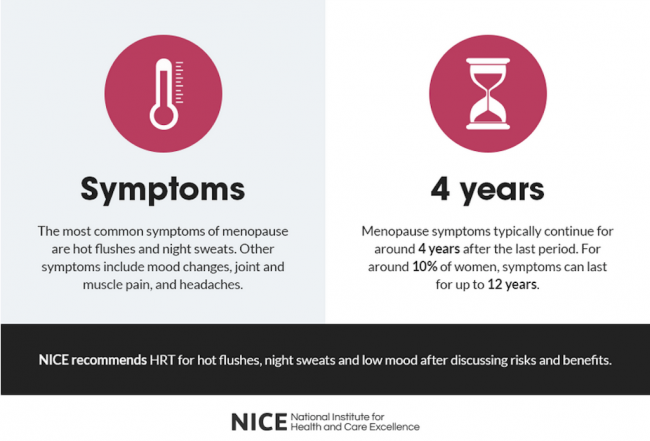 The guideline states that NICE is working with the Royal College of Obstetricians and Gynaecologists to ensure that management of menopause, including the benefits and risks of HRT, is covered within the core curriculum. It also suggests that clinical commissioning groups could help GPs with good HRT prescribing and GPs could try and educate themselves through various means. Note the use of the word ‘could’. All this is optional or voluntary and presumably only those GPs who have the time, energy or interest will update their knowledge and training about the menopause and HRT. This is why I think the guideline does not go far enough. Training around the menopause and HRT should be mandatory not optional. Given that roughly 50% of the population are women and ALL women are going to experience menopause at some stage of their lives, why is so little attention paid to it? 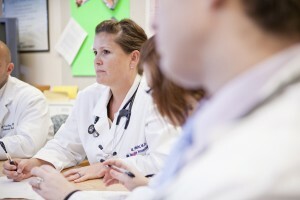 Many GPs have received little or no training in the menopause and HRT at medical school. So to advise them to prescribe HRT and then leave their further education on menopause up to them seems a little reckless to me. Even if a woman then asks to be referred to a specialist menopause clinic, these are few and far between and not every hospital has one. Some parts of the country, especially the north of England, are very poorly served, and so women wanting bioidentical hormones are unlikely to be able to be prescribed them. Many of these women, feeling desperate, fork out hundreds of pounds on consultations with private doctors and tests, only to be prescribed the exact same bioidentical hormones that are available on the NHS. There is a need for more funding of menopause clinics throughout the UK so that women aren’t subject to the postcode lottery when it comes to getting the best treatment and advice for their menopause symptoms. The NICE Menopause Guideline is a step in the right direction but it needs to go further. Changes in the medical school curriculum and GP education and further training are urgently needed so that all GPs are experienced and knowledgeable about different types of HRT and the menopause. More funding is needed to create more menopause clinics staffed with menopause specialists to cope with the growing demand from women for guidance and treatment during menopause. Unfortunately, it looks as if confusion over prescribing HRT will remain for the time being. Doctors are going to feel encouraged to prescribe HRT and my guess is that they will prescribe the kind they’re most familiar with; Premarin or Prempak-C. The history of HRT reveals that one minute it’s being hailed as a miracle cure, the key to eternal youth and a way for governments to save money by preventing disease in older women, and the next it’s surrounded with scare stories about breast cancer, ovarian cancer and endometrial cancer. For now HRT is seen as safe. Only time will tell if this is really the case.